Geneva, CH – At the 87th Geneva International Motor Show today, Suzuki Motor Corporation has revealed the all-new Swift for the European market. Sales are set to start in April 2017. The Swift is Suzuki’s flagship compact car sold more than 5.4 million units worldwide since its launch in 2004* as a world strategic model. It features distinctive and sporty styling, excellent handling and superb driving performance, manoeuvrable compact size, user-friendliness, etc. High appraisals for the Swift are also earned in Europe, making it a large driving force of automobile sales in Europe. *Based on Suzuki’s internal research as of the end of February 2017. Upon having full model change of the Swift, its development was focused on achieving innovative styling and uplifting driving performance through the adoption of extremely light and rigid new-generation platform “HEARTECT”. Nimble and agile driving performance honed on European roads, styling, sporty and functional interior, and advanced safety technologies are the main factors of the all-new Swift. 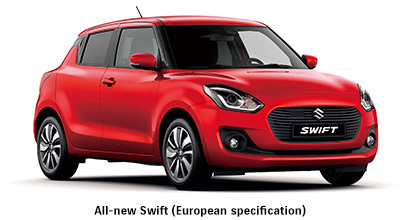 The European specification of the all-new Swift is produced at Suzuki’s Sagara Plant in Japan. Sales are set to start in April 2017. Learn more at http://www.globalsuzuki.com/geneva2017/, a special website for Geneva International Motor Show.